To protect it against corrosion, a problem that afflicts all steel bridges, it must be covered with paint. But because the bridge is constructed of so many small parts, scraping and repainting it is a gargantuan task. 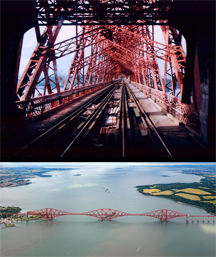 Indeed, the Forth bridge had become famous for the fact that repainting it has been continuous. By the time the painters complete the job, it has been time to start again. This latest repainting, though, has been done with epoxy, which is expected to last for 25 to 40 years. So we need a new metaphor for never-ending jobs. Technical debt might meet that daunting challenge. Controlling technical debt in large systems is a never-ending job, possibly because of Conway's Law and the ceaseless change that afflicts organizations. Aerial view Copyright © Andrew Shiva. Inside view (cc) Lexcie. Specifically, for each pair of system elements A and B that interact, there is a pair of groups of people, A' and B', respectively responsible for system elements A and B, which also interact. According to Conway [Conway 2019], Fred Brooks cited Conway's article in his classic, The Mythical Man-Month [Brooks 1982], and conferred on Conway's insight the name "Conway's Law." It was widely consistent with the state of engineering in the late 20th century, and remains so today, more or less, under the name mirroring [Querbes 2018]. Systems large and small, but especially the large ones, tend to accumulate technical debt [Cunningham 1992], which is a collection of unwelcome technical elements that contribute to lower engineering productivity or to a higher probability of defects during development, maintenance, or enhancement efforts, and which we would therefore like to revise, repair, replace, rewrite, create, or re-engineer for sound engineering reasons [Brenner 2017]. And technical debt accumulates in systems even though the organizations that design and maintain those systems have communication structures that are clearly defined. That would seem to contradict Conway's Law. If communication is so well structured, then why do the systems these organizations work on become so chaotic over time? The chaos that evolves in systems over time might be, in part, a result of Conway's Law. Technical debt has many causes, but surely one of them is the apparently endless stream of reorganizations, early retirements, promotions, terminations, offshoring, onshoring, outsourcing, insourcing, layoffs, mergers, spinoffs, and acquisitions that repeatedly disrupt the communication structures and social relationship networks of the engineers employed in large enterprises. Following each disruption is a period of adaptation in which these communication structures become orderly again. But when they do, they rarely match the structure of the systems those organizations are charged with maintaining and enhancing. Conway's homomorphism is therefore disrupted. The social communication patterns of an organization that formerly matched the structures of the systems it works on might match them no longer. That mismatch makes for difficulties in sustaining coherence of the design of those systems. Over time, as a natural consequence of Conway's Law, the system evolves toward creating a new homomorphism — that is, toward matching the new social communication structure. Sometimes it catches up. But then the cycle repeats. Unless the system design is thoroughly updated to restore the homomorphism between the system and the social communication structure, traces of the old remain, and those traces can accumulate to form what appears to be a degraded, chaotic system structure: technical debt. Conway's Lawmay be only a special case of a more general principle. Conway's Law asserts that there is a homomorphism between the modular structure of a system and the communication structure of the organization that designed the system. But the correspondence might be more than merely geometrical. For example, organizations whose cultures value elegance, or consistency, or quality are more likely to produce systems that exhibit those same attributes. And similarly, if the culture doesn't value elegance, or consistency, or quality, we can expect that culture to create systems that lack those attributes. And when the organizational culture changes, the systems "try" to match it. If they can't quite keep up, the result is technical debt. Would you like to see your comments posted here? rbrenjkfFBKmbGucQrJPMner@ChacdgRrbMSHHskbRXSEoCanyon.comSend me your comments by email, or by Web form. I offer email and telephone coaching at both corporate and individual rates. Contact Rick for details at rbrenkllyzHKrQpDCPGVsner@ChacgfzARhEOOwBVbxCvoCanyon.com or (650) 787-6475, or toll-free in the continental US at (866) 378-5470.